I appreciate the feedback. I'm familiar with the BC coilovers but given the discussions I've had with friends in factory sponsored motorsport I will not be running them on my car. German made damper and springs vs discount Taiwanese damper and springs. Lifetime warranty. Easy call. Good luck with your Bilstein's. Hope you don't have existing back problems and that your truck performs great around the track. We'll see how she does, can't find anyone who's tried this setup on a 4.8 yet so l'll give it a go. SMOKEY53 had the bilstein b16 setup and he loved it. 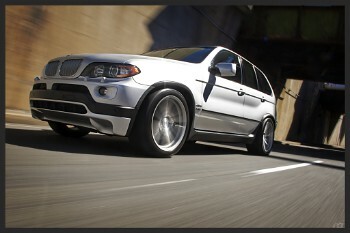 he's not active on these forums anymore (sold his x5), but you can still find his posts about it. Went with the bilstein hd dampers and h and r sport springs. Will update after install. do you by chance have a parts list of everything that you'll need to swap from air suspension? I'll let you know after the install is complete. Finished the install last night. Ride is great, smooth and controlled. Not sure what the guy above was so troubled about but harsh and stiff are not words I would use to describe this setup. Nor would I call this anywhere near a track setup. ECS conversion kit was incomplete as it did not include the upper strut mount bearings, spring seats, or plate which fits under the nut on the top of the front struts. See if I can dig up the part numbers. Install would have been MUCH faster if I had all the parts originally. Great relief to have the air suspension out. Who needs some struts/shocks or a rebuilt compressor?